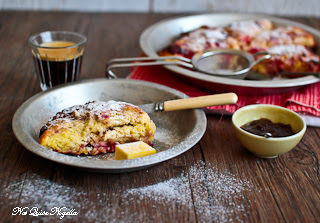 A delightful mix of cranberries and raspberries that come together with white chocolate to make a very delicious breakfast. Step 1 - Preheat oven to 200C/400F and line a baking tray with parchment. In a food processor, blend the flour, sugar, baking powder, cream of tartar and salt until well mixed. Then add the butter and process until the mixture resembles fine crumbs. 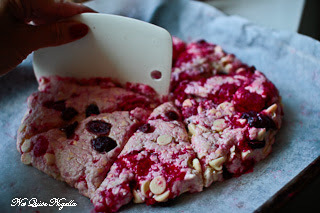 Add the cranberries, raspberries, white chocolate, yogurt and buttermilk together and mix by hand. Step 2 - Shape into a ball and place on the prepared tray. Flatten out with the palms of your hand to until about an inch thick. Using a pastry scraper or a knife, cut into eight wedges. Bake in oven for 18 minutes or so, turning once halfway. 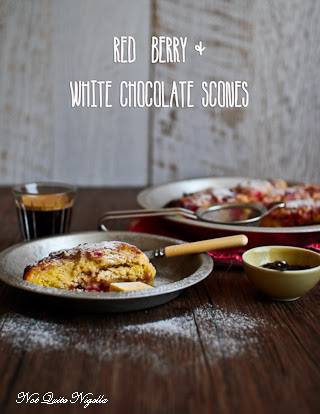 Serve with butter and jam.